Dawn Lucy (51) lives in San Jose and has been a high school English teacher for 25 years. With her blog, Fashion Should Be Fun, she encourages women over 40 to “show the world that you’re never too old to have fun and be fierce.” She is very comfortable in her own skin. Confident and at ease. Our blogger likes a wedge heel and mules, has a great eye for statement accessories and footwear, and is a master at remixing favourite items. Her style is feminine with boho, preppy and rock chick influences. Our blogger snapped up this tiger print graphic tee from the Kenzo for H&M collection. Here’s she’s wearing it untucked over cropped straight leg jeans with stepped hem (which she added herself). The black moto-style jacket together with the black multi-buckle ankle boots and black tote create a rock chick vibe. The faux fur pom bag charm provides a whimsical touch that adds textural softness. Statement chandelier animal patterned earrings are a fun nod back to the Kenzo tiger tee. Dawn Lucy wore this arty look to New York Fashion Week. The brick red asymmetrical tunic is the star of the show. The beautiful crinkled material and cowl neck with architectural drape make it really stand out. Our 5’ 7” blogger is wearing it over streamlined black culottes with a long tailored gilet for extra impact. The gilet adds lightweight layering interest and a good dose of structure. Black high-heeled cage sandals lengthen the leg line. A layered gold and garnet necklace, gold chandelier earrings and dainty bracelets echo the hardware on the handbag. Subtle red lipstick and tortoise-rimmed sunnies are the finishing touches. A relaxed casual Summer look with modern Boho vibe. Dawn Lucy is sporting cropped girlfriend jeans with an emerald green ruffle slub blouse. The square neckline with shirring and on trend ruffled bell sleeves give the outfit its fun Boho vibe. This is further enhanced by our blogger’s choice of jewellery. A long tassel necklace with beads in a rainbow of colours and bracelet with gold-toned baubles add a playful touch. The emerald with gold drop earrings complement the colour of the blouse. Neutral-coloured wedge mule sandals make our blogger’s legs go on forever. Dark red toenail polish and matching lipstick finish off the look. 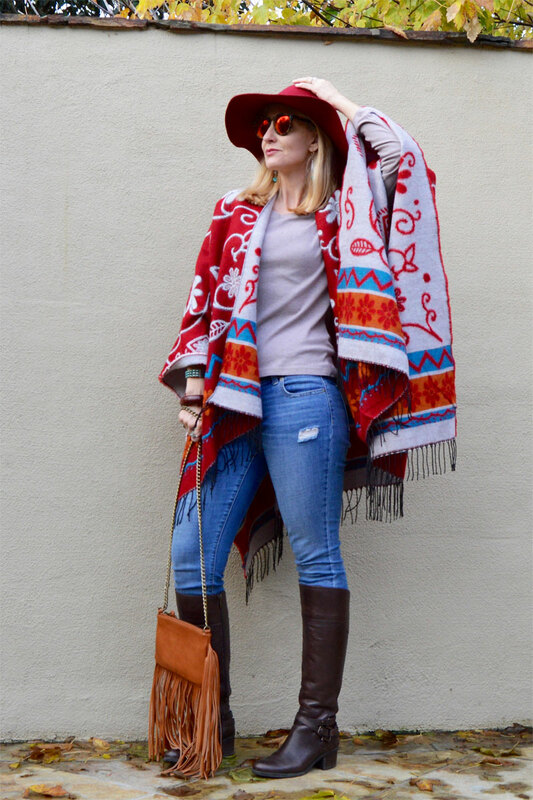 Boho meets south-western style in this casual, great-for-mild-Winters, outfit. Our blogger is wearing a simple grey long-sleeved T-shirt over distressed mid-blue skinny jeans. She’s tucked the jeans into tall dark brown boots with buckle detailing and a nice snug fit around the calves. 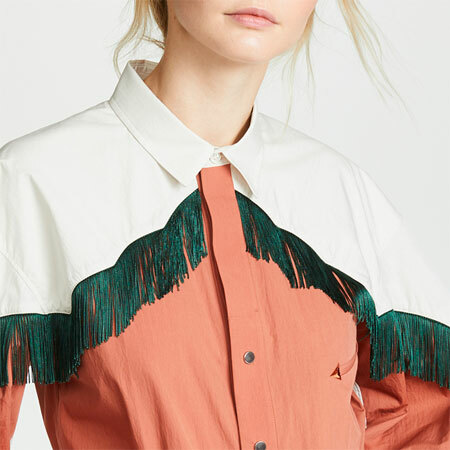 Her eye-catching reversible ruana — a poncho-like garment, specifically the type worn in the Andes region — is the statement piece here. This oversized piece with red, blue and orange swirling floral pattern provides plenty of outfit drama. Keeping the rest of the outfit streamlined tempers the unstructured volume of the poncho. Turquoise-accented jewellery and a cognac crossbody with long fringe fit the vibe of the look to a T. A red floppy hat and mirrored sunnies add further flair. A tonal New Year’s Eve look with lots of textural interest. Our blogger’s metallic silver pleated flared midi skirt is the perfect polished piece for any party. Dawn Lucy paired it with a darker grey metallic dressy tee. The shimmery T-shirt fabric and beautiful crinkle material of the skirt create textural and visual interest. 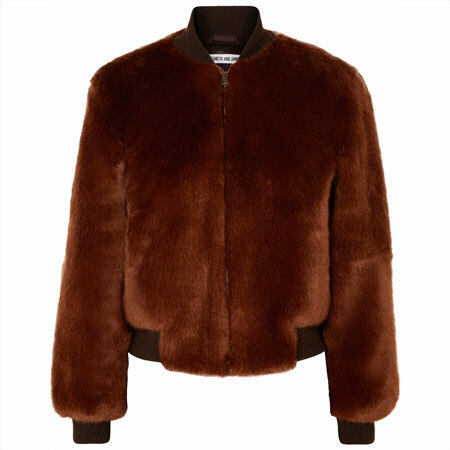 So does the quilted leather moto jacket, which adds extra sass and is easy to pop on when it gets chilly. Fire-engine red patent pointy toe pumps make the beautiful silver tones stand out even more. Plus they are the perfect happy party shoe. A small black clutch, simple drop earrings and a bright red lip are all that’s needed to go party the night away. Jeans, a striped top and red accents make for a preppy combination that never gets old. 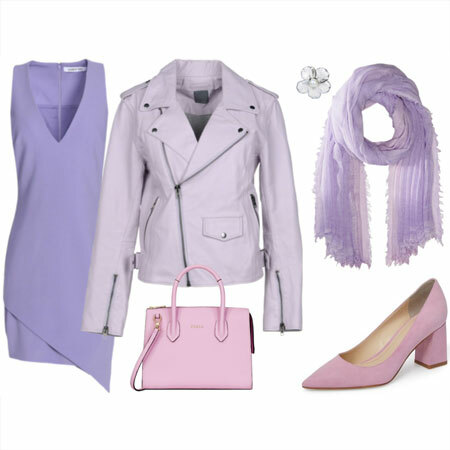 Especially not if you incorporate an on trend piece into your outfit, like Dawn Lucy does here. 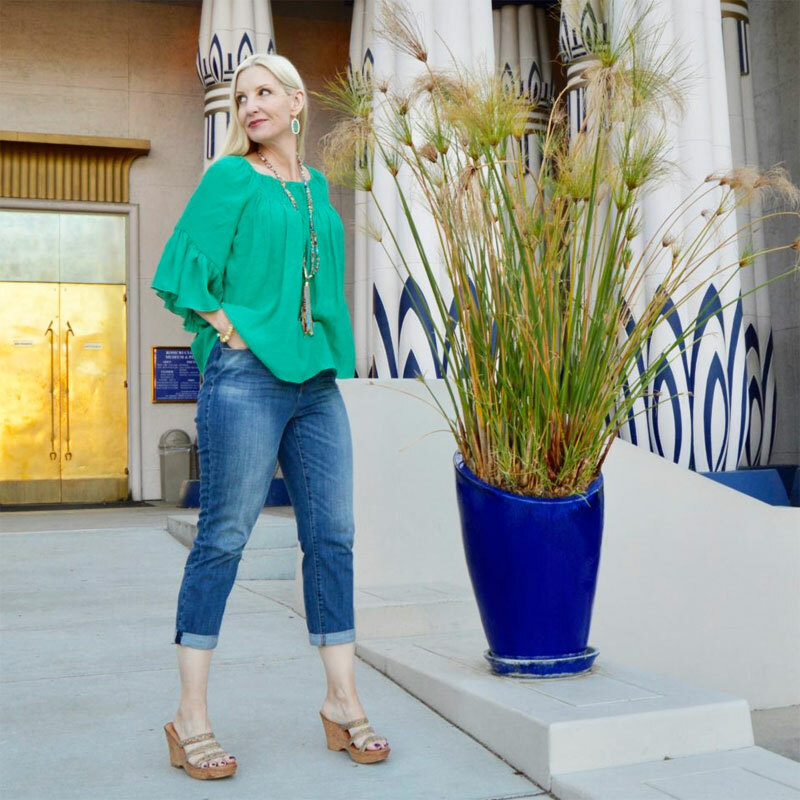 High-rise cropped wide leg jeans are all the rage and our blogger rocks the look. She’s pulled up the hem of the fluid fit striped pullover to expose the top part of the jeans, which offsets the leg-shortening nature of calf-length cropped pant styles. The dark cherry red croc patent leather mules make the blue jeans and black and white top come alive. 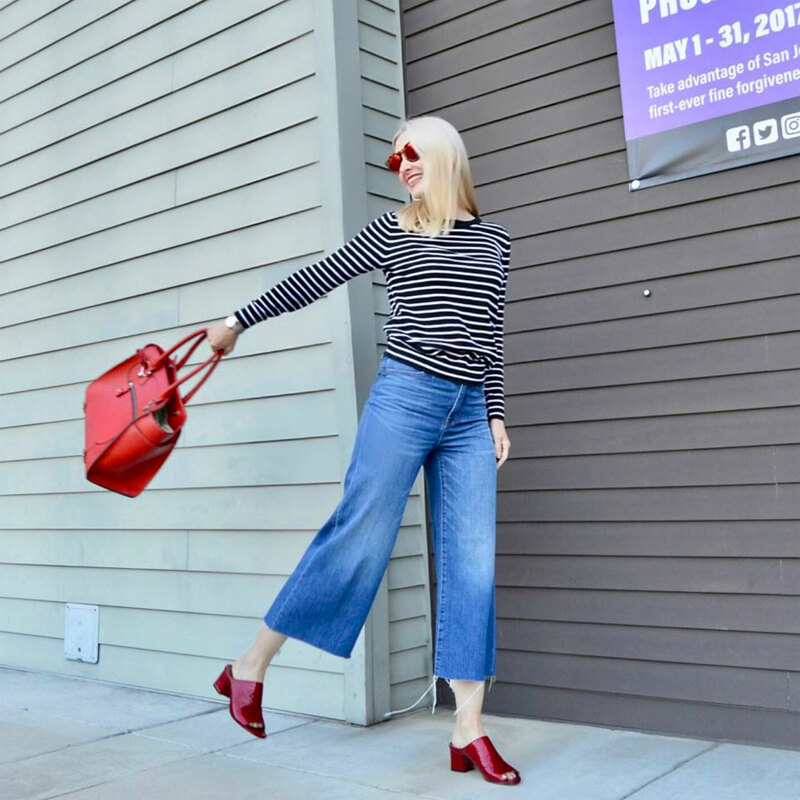 The oversized tomato red tote doesn’t match our blogger’s shoes, making it an unexpected pairing that feels modern and fresh. Her red-mirrored sunglasses come out to play again, accentuating her polished blonde shoulder-length ‘do. And they match the shoes! Let us know what you think of Dawn Lucy’s fun looks, and be sure to check out the rest of her fab outfits over at Fashion Should Be Fun. Wow – Dawn Lucy has amazing style and her sense of fun just jumps out of the screen. My favourite look is the tonal New Year’s Eve, just stunning and absolutely the best way to see in a new year. Now I want shiny red shoes too! I love her sense of style, and share her love for wedge heels. The NYE look is absolutely stunning – so pretty. I think that she is absolutely fabulous. 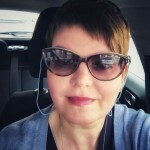 Thank you for the introduction to a new to me blogger. I think her style is very attainable but very sophisticated. And I like that! Off to visit her new blog thank you for the introduction again I really like how she did the coolest thing you know I’m not like maybe I’ll try it out this weekend. I love her sense of style. She has some great jeans! I also share her love of wedges. Thank you Inge for introducing us to her. Wow! Really wow! Great styling of a host of various items, many of which I can shop my closet for. What an inspiration! Dawn Lucy has a great sense of style and I love her sass. I like her relaxed ease. My favourite outfit (of course!) is the one with the striped top and wide crops and red accessories, but I love her in red, period. Super stylish looks – I adore the New Year’s Eve outfit with the fabulous red shoes. A lot of ideas + inspiration here for me. Dawn Lucy’s looks are a great reminder of the power of joy in fashion. Love her accessories, use of color and her restraint. Thanks for the introduction, Inge. I’ll be checking out her blog. Love the way she incorporates trends into her own signature style. I’m loving the all grey look with the silver skirt and red pumps! Dawn Lucy. I like how she uses a pop of red in so many of her outfits. I can identify with Dawn Lucy’s belief that being fierce and fashionable has no age limit. I am loving her New Year’s Eve style and her red asymmetrical tunic wth the long vest and crops. If those items are available in a petite size, will be copying her look. Thank you for introducing us to Dawn Lucy. She has a PONS, (a Polish Lowland Sheepdog) like Mags shown on the June 24th blog entry! That aside, I enjoyed her outfits and your descriptions. On her I liked the first and last outfits that you featured best. You had me at boho! I adore that poncho look. And the emerald top is a lovely color and a fun shape as well. Thanks for sharing! Loving her high rise cropped wide leg jeans. Right on trend and fab with the stripes (of course Inge would feature stripes! lol). I love her New Years Eve outfit. All grey, with a pop of red. I want a skirt like that! Not only does Dawn have Killer style, but the ease with which she carries it off is inspirational. Relaxed confidence, utterly relatable style, and simply having fun with fashion. FABULOUS. Laura, I can see Inge in the last outfit with a lower heel. Gorgeous. I love all the looks, but the last three are my faves. Playful Elegant Verve. Bijou and Eliza – Yes! It’s so obvious that Dawn Lucy is having fun, which is just the best!! Ledonna – Couldn’t agree more. And can’t wait to see what you come up with. Abby – Brilliant that you can shop your closet! lozz_oz and Beth Ann – Dawn Lucy’s New Year’s Eve look is gorgeous for sure. Runcarla – Exactly! And yes, the red accents are so effective. Mary Anne – It certainly is a motto I believe in with my whole heart. Joy – Yes! Such a sweet dog! Lisa – I had a feeling the poncho look would appeal to you. JAileen – It’s such a good skirt, isn’t it. Angie – Agreed 100%!! And I would wear that last outfit in a heartbeat! 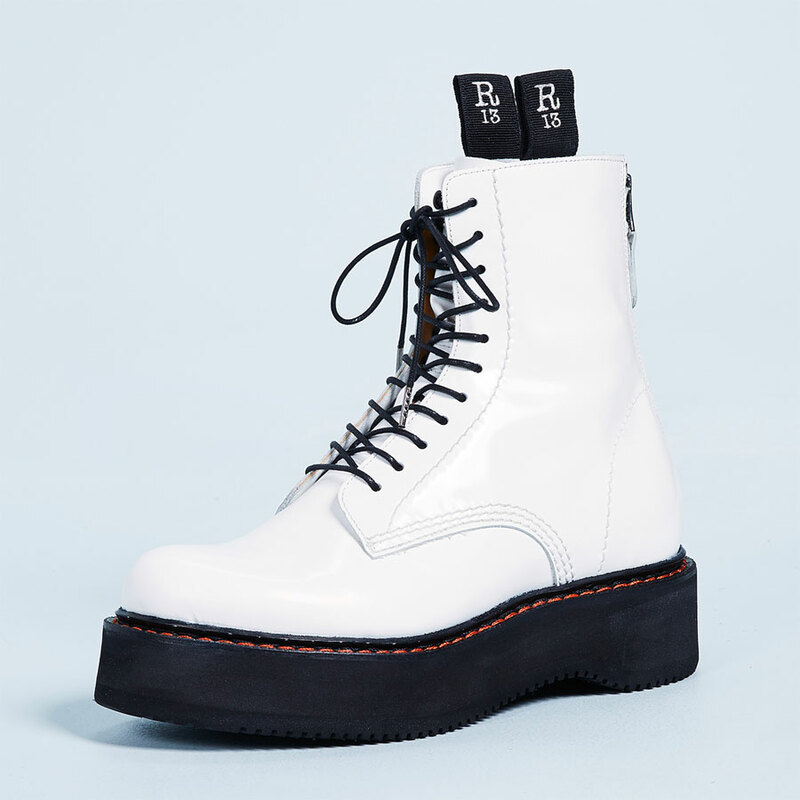 Wish I could find a similar shoe in that exact same colour with a lower heel. Thanks Inge, I loved her style and all her outfits. My favorites were 1, 2, and specially 6. She is stylish and faboulus , I especially like the last outfit and that with red asymmetric tunic. What great style Dawn has…and she looks like she is having a blast…love that! Love! I would subtract the heels, but they look great on Dawn. Dawn’s style is super fab!! The New Year’s Eve outfit is perfection!!!! I love her style – I think my fave is the one with the metallic skirt!! Dawn Lucy wears her style with such joy! And another vote for the NYE outfit as my fav. Great variety of outfits. She has great colouring. I love the jade green top with the jeans. The NYE is probably my favourite too. These are great. NOT costumey. I think that can be a problem with being a fashionista. I’d wear all of these all day. Great shoes, wonderful outfits and I love the last look so much. I want to go shopping with her! WOW – just fabulous! Love every single outfit. Looks polished but not stuffy – does that make any sense? Great style! I can see putting together some similar outfits myself. Especially the one with the long vest, and I like the DIY staggered hem jeans. I’ll have to check out her blog further. I noticed in her roundup of dresses, two that I recently tried on in Anthro. One came home with me. I should post in the forum about it. Love her style! I think this may be the first time I’ve clicked through to one of the featured bloggers specifically to see if I can buy some of the pieces she’s wearing! I love a stylish source of inspiration, and doubly fun that she is my age. And she has a big hat. I will check out her blog! Wow, wow! I like her style. Lots of jeans-style inspiration here for me! Bookmarking her blog. I see there is a mistake in my reply. The doggie is in the June 14th entry. They are the clowns of the dog world. Dawn’s outfits look wearable and ageless except for the heels. I think I have that same black vest/ sleeveless coat that she is wearing with the red top. Thanks very much for chiming in Dianna, Mirjana, April, Dana, JuniperGreen, Cheryl, merwoman and Firecracker. Carole – She sure is! 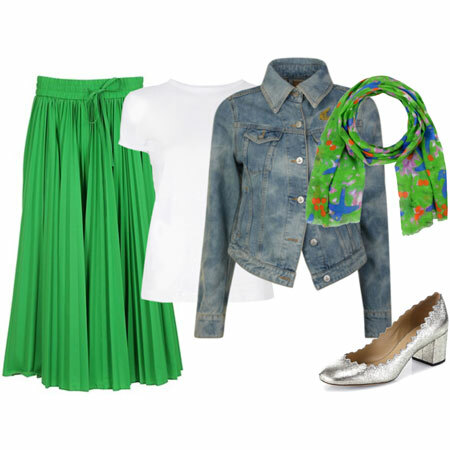 Jane – The outfit with the green top is fab for sure. Janet – You would look marvelous in something similar. And I just saw your thread about the Anthropologie dress: that is a keeper for sure!! Rachelthrives – Oh, marvelous that you are feeling so inspired. Thanks, Joy. Dawn Lucy’s doggie is soooo cute. And fun that you have the same gilet! Gosh, I live in San Jose – she has got to be the most stylish lady in the area! Love the outfits and thank for telling us about her, I’m starting to read her blog TODAY! How fun, klauren, perhaps you’ll run into Dawn Lucy somewhere this Summer Have fun catching up with her blog. Thanks for chiming in Susan! Wow, I can’t thank everyone enough for the sweet comments! Hope to keep in touch through my blog and/or on Instagram! Great style. My favourites are the colourful ruana outfit and the metallic grey outfit with the red shoes.